VANDERMAELEN -Isles Malouines ou Falkland. No.41. VANDERMAELEN,Ph. - Isles Malouines ou Falkland. No.41. Isles Malouines ou Falkland. No.41. - VANDERMAELEN,Ph. 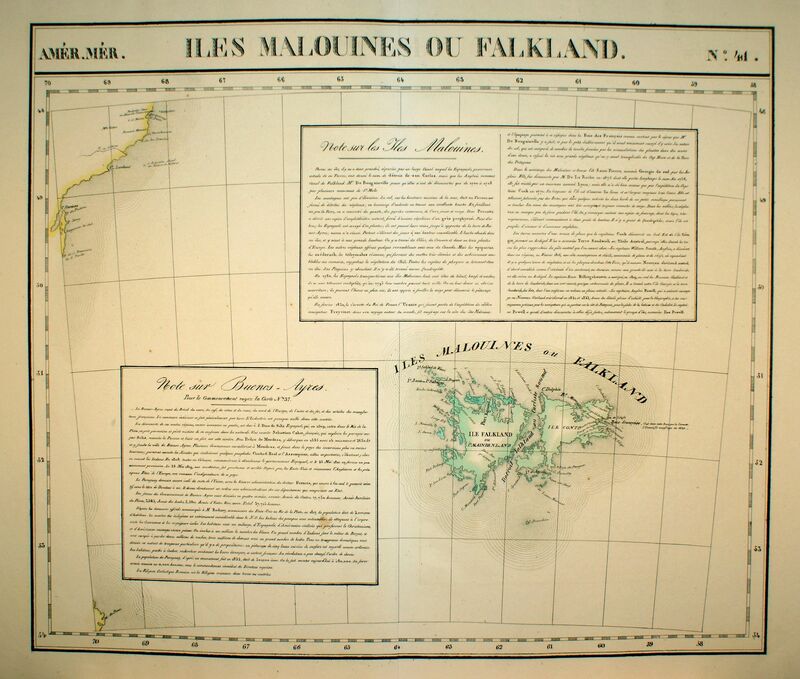 Title : Isles Malouines ou Falkland. No.41.. Size : 18.6 x 22.3 inches. / 47.3 x 56.7 cm. Description :PLANO sheet map covering The Falkland Islands, including small tip of Argentina's coast. With a text block dealing with the area and one with Buenos Ayres. From his famous Atlas Universel . This atlas was one of the most remarkable world atlases ever produced, anticipating the International Map of the World and being the first atlas to show the entire land mass of the world on a uniform scale. Supported by the fortune of his parents and assisted by his brother, Jean-François, Vandermaelen built a spacious geographical Institute in 1829, in which he installed a map-drawing section, a library and a museum. He published one of the most remarkable world atlases ever made: a world atlas with ca.400 maps on a uniform scale of ca. 1:1,6 million. This work, which appeared in 1827, was far ahead of its time but its appearance could only be justified by the unparalleled zeal of its author. This atlas was also the first to be made totally with lithography, carried out by Henri Ode, who applied a new technique, especially designed for the Atlas Universel.